You are welcome to share your own demo with us in the demonstrations! Let´s make a big and fun demo together! Maximum number of participants in the seminar is 45 persons. Bring friends and family to the demonstration and the party! Please pay before 9th of August to secure your attandance. T-shirt size, only for seminar participants. 25 Yrs celebration SIGN UP! 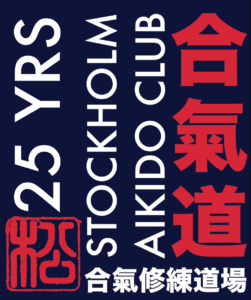 Sign up for our seminar and party celebrating 25 years as a traditional dojo. 2 - Are you coming to the seminar? If no, skip to 4. If yes, In that case we need to know your t-shirt size. 3 - What type of t-shirt? Sign your e-mail address. Confirm your e-mail address.